In this article, We will learn how to generate random numbers and data in Python using a random module and other available modules. In Python, random module implements pseudo-random number generators for various distributions including integer, float (real). After this article, solve our Free Python random data generation Exercise. And Free Python Random data generation Quiz to master random data generation techniques in Python. Following are the list of common operations that we are going to cover in this article. Generate random numbers for various distributions including integer and floats. Random Sampling and choose elements from the population. Functions of the random module. Shuffle the sequence data. Seed the random generator. Generate random strings and password. How to set the state of a random generator. Use numpy.random to generate random arrays. The article links provided in this article is also written by me to cover subtopic in detail. The random module has various functions to accomplish all of the above tasks. We will see how to use these functions in the latter section of the article. You need to import the random module in your program, and you are ready to use this module. Use the following statement to import the random module in your code. Let see how to use random module now. As you can see we have got 0.50. You may get a different number. random() is the most basic function of the random module. Almost all functions of the random module depend on the basic function random(). random() return the next random floating point number in the range [0.0, 1.0). Before moving to the random module functions, let see the common uses cases first. Let see the most common use of the random module. I.e., generate a random number. Use randint () function to generate a random integer number in Python. To generate random integers, we can use the following two functions. The following example generates a random number between 0 and 9. We will see various ways of generating the random number in Python in the latter section of this article. Assume you have the following list of cities and you want to retrieve an item at random from this list. Let see how to do this. Now let see the different functions available in the random module. Return a random integer Number such that a <= Number <= b. A randint(a,b) works only for integers. The randint(a,b) function accepts two parameters, and both are required. The resultant random number is greater than or equal to a and less than or equal to b. Use this method to generate a random integer number within a given range. For Example, generate a random number between 10 to 50. The step is a difference between each number in the sequence. The step is optional, and the default value of the step is 1. Refer our complete guide on randrange () in Python. Use the random.choice method to pick a random element from the sequence. Here sequence can be list or string. This method returns a single item from the sequence. Refer our complete guide on random.choice() in Python. Use this method when we want to pick more multiple random elements from a population. Sample method returns a list of unique elements chosen from the population. Count of the total elements depends on the size of k.
The population can be the list, set or any sequence. Refer our complete guide on random.sample () in Python. When you want to choose more than one element from the sequence randomly, then use this method. Choices method introduced in python version 3.6 and it can repeat the elements. The seed method is used to initialize the pseudorandom number generator in Python. The random module uses the seed value as a base to generate a random number. If seed value is not present, it takes a system current time. Refer our complete guide on random.seed () in Python. To shuffle or randomize list or other sequence types. The shuffle function shuffles a list in-place. The most common example is shuffle cards. Refer our complete guide on random.shuffle () in Python. Use random.uniform() to generate a floating point number within a given range. The end-point value may or may not be included in the range depending on floating-point rounding. For example, Generate random float number between 10.5 to 25.5. Refer our complete guide to Generate random float numbers in Python. The random.triangular() function returns a random floating point number N such that lower <= N <= upper and with the specified mode between those bounds. The default value of a lower bound is ZERO, and upper bounds are one. Moreover, the peak argument defaults to the midpoint between the bounds, giving a symmetric distribution. Use the random.triangular() function to generate random numbers for triangular distribution to use these number in a simulation. i.e., to generate value from a triangular probability distribution. Free random data generation Exercise to master random data generation techniques in Python. In this section, I will let you know how to generate a random string of a fixed length in python. 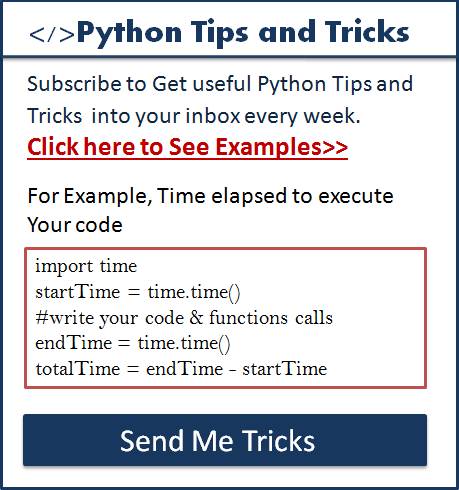 Refer our guide to Generate the random string in Python. Generate random the string of fixed length. Get the random alphanumeric string with letters and digits. Generate the random password which contains the letters, digits and special symbols. Random Numbers and data generated by the random module are not cryptographically secure. So How to generate a random number that is cryptographically secure in Python? cryptographically secure pseudo-random number generator is a random number generator which has the properties that make it suitable for use in cryptography application where data security is essential. All cryptographically secure random generator function returns random bytes. Random bytes returned by this function depend on the random sources of the OS. Quality of randomness depends on randoms sources of the OS. Refer our guides which cover the above topic in detail. Cryptographically secure random data in Python. The random module has two function getstate and setstate which helps us to capture the current internal state of the random generator. Using this state, we can generate the same random numbers or sequence of data. The getstate function returns an object by captures the current internal state of the random generator. We can pass this state to the setstate method to restore this state as a current state. Note: By changing the state to the previous state we can get the same random data again. For example, If you want to get the same sample items again, you can use these functions. The setstate() function restores the internal state of the generator to the state object. i.e. it applies the same state again. This state object can be obtained by calling the getstate function. If you get a previous state and restore it, then you can reproduce the same random data again and again. Remember you cannot use different random function, nor you can change parameters value. By doing this, you are altering the state. Let see the example now to have a clear understanding on how to get and set the random generator in Python. As you can see in the output, we are getting same sample list because resetting the random generator. PRNG is an acronym for pseudorandom number generator. As you know using the Python random module, we can generate scalar random numbers and data. Whenever you want to generate an array of random numbers you need to use numpy.random. numpy has the numpy.random package which has multiple functions to generate the random n-dimensional array for various distributions. Now, Let see some examples. use the numpy.random.random_integers()to generate a random n-dimensional array of integers. Use the numpy.random.choice() to generate the random samples. Use this method to get single or multiple random numbers from the n-dimensional array with or without replacement. Let see the examples now. We will cover other numpy’ s random package functions and their use in the upcoming articles. Python UUID Module provides immutable UUID objects. UUID is a Universally Unique IDentifier. It has the functions to generate all versions of UUID. Using uuid.uuid4() function, you can generate a 128 bit long random unique ID ad it’s cryptographically safe. These unique Ids are used to identify the documents, Users, resources or any information in computer systems. Learn more on the UUID module. I have created a simple dice game to understand random module functions. In this game, we have two players and two dice. One by one each player shuffle both the dice and play. The algorithm calculates the sum of two dice number and adds it to each player’s scoreboard. The Player who scores high number is the winner. """#Both Eric and Kelly will roll both the dices using shuffle method"""
To practice what you learned in this tutorial, I have created a Python random data generation Quiz and Exercise project. 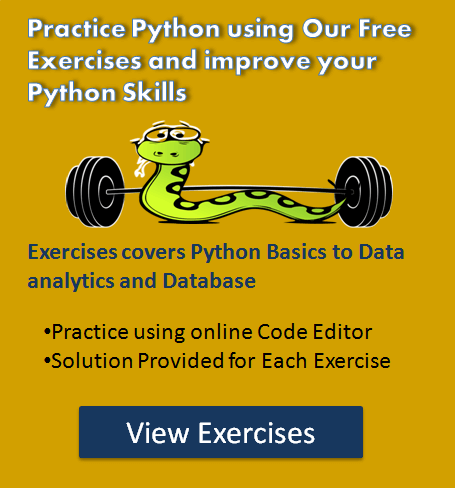 Solve the Free Exercise project to practice and master the random data generation techniques in Python.